NIRD Hyderabad PGDRDM Admission 2018 is done on the basis of Entrance Exam conducted by National Institute of Rural Development and Panchayati Raj. NIRDPR offers a fifteenth fully residential One-year ‘Post Graduate Diploma in Rural Development Management (PGDRDM) course to the students. The main objective of this course is to create a committed and competent cadre of rural development professionals in the country. Those candidates who want to get admission in this PGDRDM course of NIRD must appear in the entrance examination that will be conducted on 19 November 2017 in various cities. To appear in this entrance test candidates have to fill the application form. The last date of application submission for NIRD Hyderabad PGDRDM Admission is extended to 10 November 15 November 2017. Last Date of Application Submission - Extended! Candidates must have Bachelor’s Degree in any discipline from a UGC recognized University. Candidates, who are in the final year and expect to complete all the requirements of graduation before 1 January 2018, may also apply. Online: Candidates can fill the application form for PGDRDM course of NIRD Hyderabad PGDRDM through online mode. Candidates can click on the following link to fill the application form. Candidates are advised that they should obtain the correct amount of Demand Draft for the application fee and keep softcopy of all required documents ready to upload in the predefined format before filling the application form. Offline: Candidates can fill the PGDRD application through the offline mode also. They need to download the application form which available on the official website of NIRD. STEP 1: Fill General Details in Application Form: Candidates have to fill their general details such as Name, DOB, Gender, Contact Detail, etc. STEP 2: Fill Academic Detail: Candidates have to fill their educational information in the given section. STEP 3: Add Demand Draft Detail: The details of demand draft that made for application fee payment has to be filled in the given section. STEP 4: Upload the Required Documents: Candidates have to upload the scanned copy of the required documents in the application form. Candidates are advised that keep softcopy of all required documents ready to upload in the predefined format before filling the application form. STEP 5: Download the Confirmation Page: After filling all details in the application form, candidates are required to download the filled application form for final submission. The application form filled by online or offline mode has to be submitted through offline mode along with the correct amount of demand draft and attested copies of documents at the following address. Those who uploaded the documents in the online application form no need to send again. The application fee has to be submitted through the offline mode in the form of Demand Draft. The demand draft has to be drawn in favor of NIRD-PGDRDM payable at Hyderabad and required to send it along with the application form. The candidate has to write his/her Name, Mobile number and Address at the backside of the Demand Draft and send the original DD along with the application. Written Test - The All-India Entrance Test will measure candidate’s verbal, quantitative and analytical competencies including the English Language. The selection committee will select the candidates for GD & PI round. 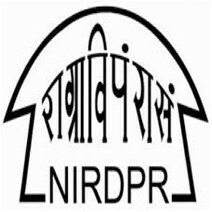 Candidates must note that NIRDPR may cancel, add new centres or assign any other centre to the applicants.